Adamski, Barbara K.. "Lacrosse". The Canadian Encyclopedia, 10 October 2018, Historica Canada. https://www.thecanadianencyclopedia.ca/en/article/lacrosse. Accessed 25 April 2019. Lacrosse is one of the oldest organized sports in North America. While at one point it was a field game or ritual played by First Nations, it became popular among non-Indigenous peoples in the mid-1800s. When the National Lacrosse Association of Canada was formed in 1867, it was the Dominion of Canada’s first governing body of sport. Lacrosse was confirmed as Canada’s official summer sport in 1994. The Canadian national lacrosse teams (men and women) rank highly in the world standings, both in field and box lacrosse. Men from Kanien'kehá:ka (Mohawk Nation) at Kahnawà:ke who were the Canadian lacrosse champions in 1869. Image courtesy of Library and Archives Canada/C-001959. Beers promoted lacrosse in Canada by claiming that it "knocks timidity and nervousness out of a young man, training him to temperance, confidence and pluck" (courtesy Canada's Sports Hall of Fame). Through the 1880s, lacrosse enjoyed sustained growth, spreading from coast to coast, and by 1900 it was likely Canada's favourite sport, though never, as is often said, the "national sport" (courtesy Library and Archives Canada). In 1904 the Winnipeg Shamrocks won the Olympic gold medal in one of only two times lacrosse was an Olympic event (1904 and 1908). Just three teams competed that year, the Shamrocks, a Mohawk team from Ontario and an American team. The Americans received the silver and the Mohawks the bronze. Images: Manitoba Sports Hall of Fame & Museum. 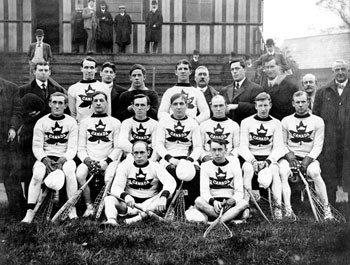 Canada's lacrosse team, gold medallists at the 1908 London Olympics. The team defeated Great Britain to win Canada''s second-ever gold in the sport. It would be the last time lacrosse was offered as a medal sport at the Olympics (courtesy Canadian Press Archives). Lacrosse is a team sport in which players pass, catch, and carry a rubber ball, using sticks with a netted pouch at one end. The object of lacrosse is to accumulate points by shooting the ball into the opposing team's goal. The early versions of the game involved large teams of Indigenous warriors playing over a field that could be over a kilometre in length. Since that time, lacrosse has changed significantly, and there are now four distinct games in Canada: men's field lacrosse, women's field lacrosse, box lacrosse, and inter-crosse. The history of lacrosse is difficult to trace, for fact often meshes with fiction, and many aspects of the sport's history have been passed on as folklore. One of the most famous legends involving lacrosse dates from Pontiac's Rebellion of 1763, in which the Odawa chief reportedly staged a game in order to distract British soldiers and gain entry to Fort Michilimackinac	in what is now Michigan. 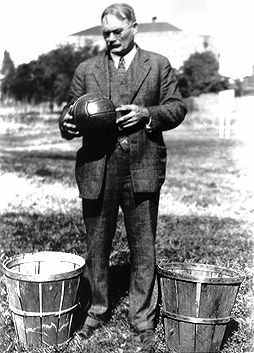 First Nations warriors had played similar ball games for centuries before this early exhibition game. Members of the various Algonquian language groups referred to early ball games as baggataway. Strong similarities among the war club, lacrosse stick, and even the drumstick, shown in photos of early Ojibwa implements, support the connection between these early ball games and the later development of lacrosse. There is also a strong link between lacrosse and the Mohawk ball game known as tewaarathon. As with other early Indigenous ball games, tewaarathon served a number of functions; as the game was played by a large number of warriors on fields that could be over a kilometre long, it kept young men fit and strong for both war and hunting. It could also be played to strengthen diplomatic alliances, support social conformity and economic equality, and honour the gods. In general, Aboriginal women were excluded from these games, although in some First Nations women did play ball games on their own, or with men. One of the first written Canadian references to the activity of lacrosse appears in the 1637 journals of Jesuit missionary Jean de Brébeuf. In his journal, Brébeuf records entire villages playing each other in games of “crosse.” While some authors allege that Brébeuf gave the sport its name because the stick resembled a bishop's crosier, Brébeuf's own writings mention nothing of the similarity; moreover, he does not provide a clear enough description of the activity to determine whether these ball games were the same as the game of lacrosse. Historian Douglas Fisher argues that the origins of modern lacrosse lie in the Mohawk game of tewaarathon. After the American Revolution, many Haudenosaunee	relocated along the St. Lawrence River and the Grand River. The Haudenosaunee had allied with the British government during the war, and were forced to leave their traditional lands when the young Republic gained its independence. The Mohawk at Saint Regis, a Jesuit	mission close to Montréal, played ball games so frequently that the missionary complained it interfered with attendance at church. 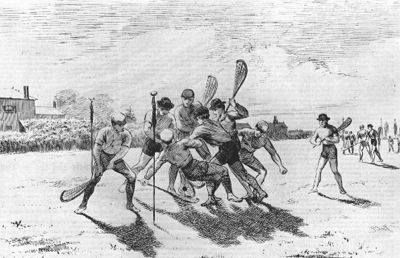 In the 1830s, visiting anglophones from Montréal noticed the games and learned to play from their Mohawk neighbours, adopting the French term lacrosse for their new pastime. The first recorded match between anglophones and Mohawk took place on 29 August 1844. 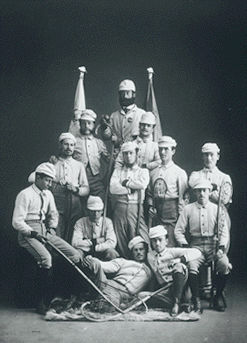 In 1856, lacrosse enthusiasts formed the Montreal Lacrosse Club, followed soon by the Hochelaga and Beaver Clubs. When the Prince of Wales visited Montréal in August 1860, the locals staged a “Grand Display of Indian Games,” including a match between two Indigenous teams, and another between an Indigenous and an Anglo-Canadian team. 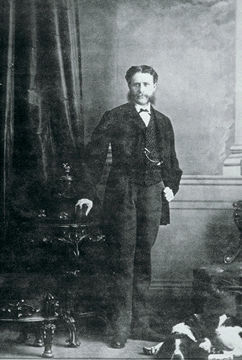 In September 1860, one month after the Prince’s visit, a young dentist named William George Beers wrote a pamphlet that set out some rules and instructions for the game, which until then had had no written regulations. Beers, a strong nationalist, not only designed a set of rules for the game, but also replaced the deerskin ball with one of hard rubber. He became known as the father of modern lacrosse. In 1867, the sport made its first appearance overseas, when Captain W.B. 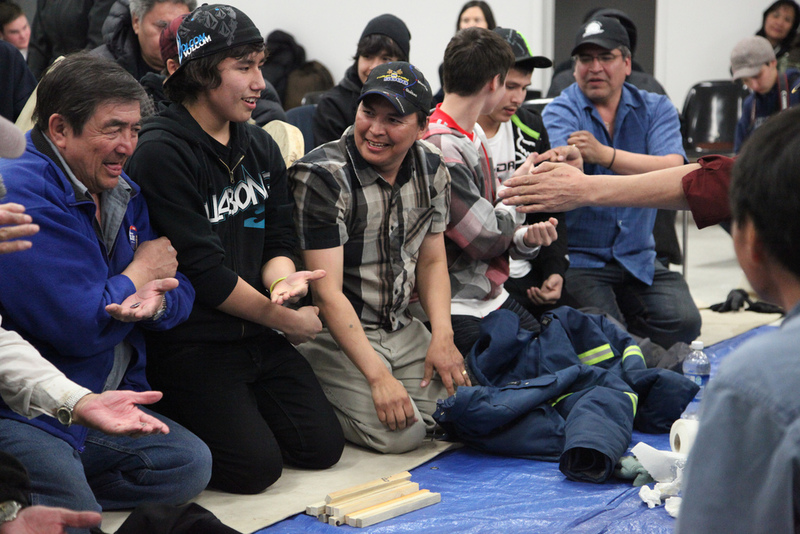 Johnson organized a tour to England; the group included 16 paid players from Kahnawake as well as amateur players from the Montreal Lacrosse Club. In 1876, two squads (one from Kahnawake and the other from Montréal) toured Britain, playing in front of Queen Victoria at Windsor Castle. A third successful tour followed in 1883. The National Sport of Canada? Mythology surrounding lacrosse still abounds, particularly with respect to its status as the National Sport of Canada. Beers was so enthralled with the sport that he felt it should be the national game, even though, at the time of Confederation, cricket	was the most popular summer sport in the land. 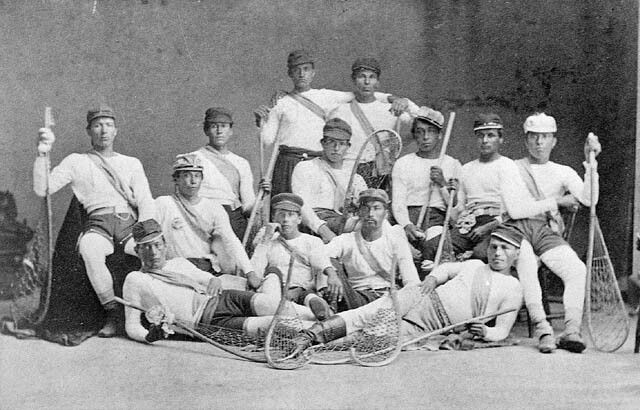 In 1867, the Dominion's first national sport governing body, the National Lacrosse Association of Canada, was formed, adopting as its motto: "Our Country and Our Game." Beers campaigned for lacrosse to be named the country’s national game, and claimed that Parliament had made it official in 1867. However, even though many Canadians believed Beers, there is no evidence that Parliament officially proclaimed lacrosse as the national sport at that time. While there may not have been any official parliamentary record of lacrosse being proclaimed the national sport of Canada in 1867, it was arguably the de facto national sport for many decades. In 1994, however, a zealous hockey fan and Member of Parliament, Nelson Riis, introduced a private member's bill that declared hockey the national sport of Canada. After much debate, the bill was amended to make hockey the official winter sport and lacrosse the official summer sport. The National Sports of Canada Act received royal assent in May of that year. To many lacrosse fans, however, lacrosse has always been the only national sport — and always will be. Visitors to the Canadian Lacrosse Hall of Fame in New Westminster, British Columbia, will notice that the bronze plaques listing the Hall of Famers continue to be embossed with, "Canada's National Game." There are four distinct versions of lacrosse played in Canada today: men's field lacrosse, women's field lacrosse, box lacrosse, and inter-crosse. Men's field lacrosse is played by two teams of 10 on an outdoor field. The most noticeable difference between field lacrosse and other forms is the use of much longer sticks by the three defencemen on each team. Canada has a rich history in field lacrosse, and from 2009 to 2013 one Canadian team — the Hamilton Nationals (formerly Toronto Nationals) — competed in Major League Lacrosse, a professional field lacrosse league in North America. The Canadian national team is one of the top field lacrosse teams in the world, and competes in the World Lacrosse Championships, which take place every four years. 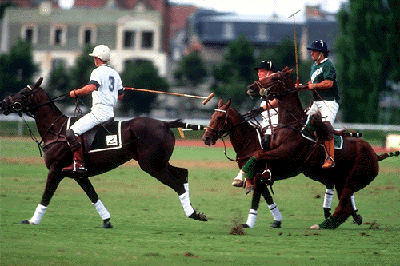 In 2006, Canada won its first championship in nearly three decades when it defeated the United States of America 15–10. At the 2010 Championships in Manchester, England, Canada was narrowly defeated by the US team in the championship final. The 2010 World Lacrosse Championships were notable for the absence of one of the strongest lacrosse teams in the world, the Iroquois Nationals. The Iroquois Nationals represent the Haudenosaunee	on both sides of the Canada–US border; it is the only ​Indigenous​ team that has been sanctioned to compete in international sporting competitions. The team was accustomed to travelling with their Haudenosaunee passports, but British officials refused to allow them entry, stating that the passports were not acceptable forms of identification. The Iroquois Nationals had competed in the world championships since 1998, winning fourth in 1998, 2002 and 2006. However, as they did not play in 2010, they were automatically demoted to last place in the world standings. After the team launched two appeals, the Federation of International Lacrosse announced in June 2013 that the Iroquois Nationals would compete in the elite Blue Division in the 2014 Championship. In 2014, Canada won the men’s world championship, defeating the United States, while the Iroquois Nationals finished third. Two years later, the Canadian team finished second at the men’s under-19 championship, with the Nationals coming third (the US won the title). In 2018, Canada won silver at the men’s world championship, losing 8–9 to th United States in the gold medal game. The Iroquois Nationals again took bronze, defeating Australia 14–12. Women's field lacrosse is a non-contact sport played with 12 players per team. Ball movement and effective stick handling are key elements of the sport, and the shallowness of the stick's pocket makes catching and maintaining control of the ball more challenging. The first game of women's field lacrosse took place in Scotland in 1890, and the first international women’s match was played at Richmond Athletic Ground (near London, England) in 1913 between Scotland and Wales. The game spread from the British Isles to North America, although there seems to have been more resistance to women’s lacrosse in Canada than the United States (see Hall). Team Canada has ranked among the top women’s lacrosse teams in the world. At the FIL World Cup in Oshawa, Ontario, in July 2013, the Canadian senior women’s lacrosse team reached the final for the first time in their history, losing to the defending American champions. With their silver medal, the team moved to second in the world standings. The women’s under-19 team won the world championship in 2015. Two years later, the senior women’s team again won silver at the world championships, losing 10–5 to the United States. The Canadian women’s lacrosse team is currently ranked second in the world, while the Iroquois Nationals women’s team is ranked 12th. Box lacrosse was developed in Canada in the 1930s as a way to take advantage of hockey arenas left vacant during the summer months. It is the most popular form of lacrosse in Canada, and is played by both men and women (indeed, many top field lacrosse athletes play box lacrosse as well). Boxla (as it is also known) is sometimes referred to as the fastest sport on two feet. The game is played by teams of six players; rebounds and checks off the boards make the game exciting to watch, and a 30-second shot clock, which requires a team to either shoot in half a minute or relinquish the ball to their opponent, leads to a high-scoring game. Box lacrosse is usually played on a cement surface. However, professional indoor lacrosse (which is very similar to box lacrosse) is played on a turf carpet. A number of Canadian teams compete in the National Lacrosse League, a professional indoor lacrosse league in North America, and several Ontario teams competed in the professional Canadian Lacrosse League from 2012 to 2016 (the league folded in 2016). Box lacrosse is very strongly represented in Canada, and the national team has won every World Indoor Lacrosse Championship since the competition first began in 2003. The Iroquois Nationals team placed second in all four championships (2003, 2007, 2011, 2015), and was only narrowly defeated in overtime during the 2007 final. Inter-crosse, the newest form of lacrosse, is a low-risk activity, designed for schools and recreation programs. The easy-to-play indoor game uses molded plastic sticks and a soft, lightweight ball, and teaches participants the fundamentals of lacrosse: scooping, carrying, passing, and catching the ball. See also Sports History, Édouard Lalonde, Lacrosse: From Creator’s Game to Modern Sport, The Iroquois Nationals and the 2010 World Lacrosse Championships, Legends of Lacrosse Exhibit. W.G. Beers, Lacrosse: The National Game of Canada (1869, rev 1879); Jim Calder, Ron Fletcher, David Craig, Arnold Jacobs, and Delmor Jacobs, Lacrosse: The Ancient Game (2011); Donald M. Fisher, Lacrosse: A History of the Game (2002); Thomas Vennum Jr, American Indian Lacrosse: Little Brother of War (1994). See also M. Ann Hall, The Girl and the Game (2002) and Don Morrow and Kevin Wamsley, Sport in Canada: A History (2013). Association canadienne de crosseLe site Web officiel de l'Association canadienne de crosse. Canadian Lacrosse AssociationThe official website of the Canadian Lacrosse Association.